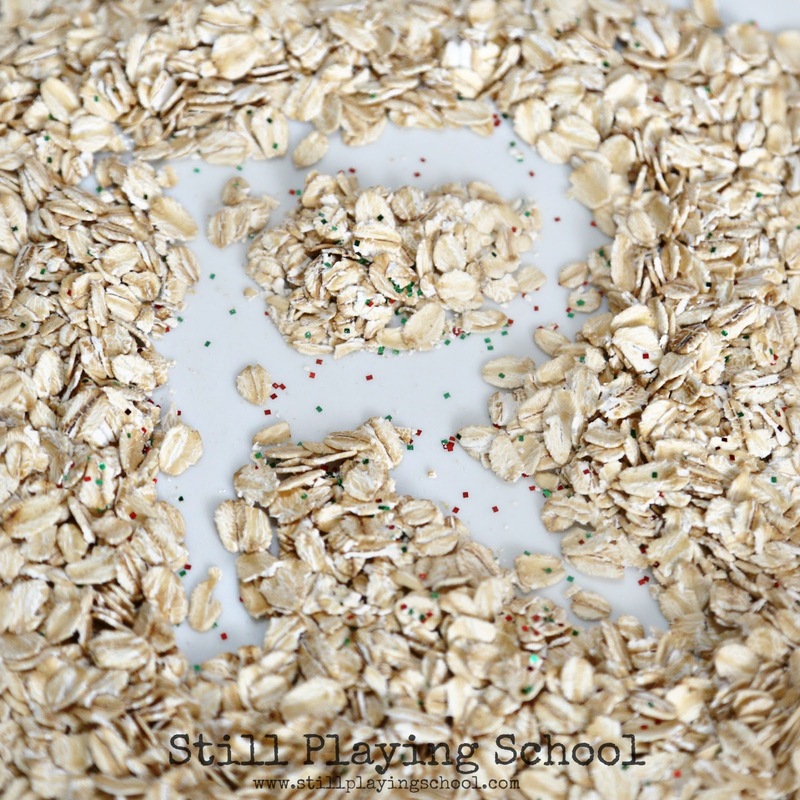 Do you make magical reindeer food with your kids? 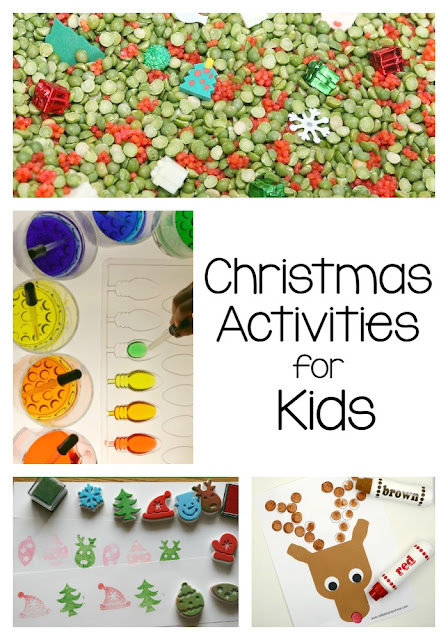 It's one of our most cherished traditions but this year I was inspired to see if I could sneak a bit of fine motor work into the Christmas fun. We created a reindeer food writing tray! 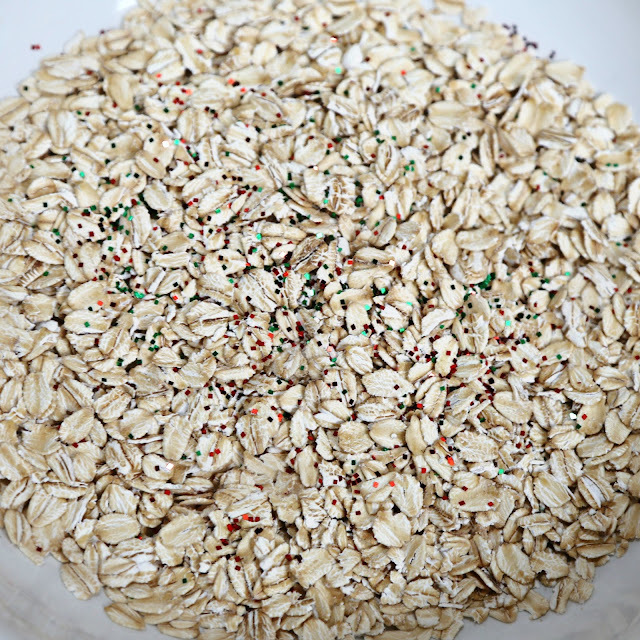 Reindeer food to leave out for Santa's team is easy to make with simple ingredients. 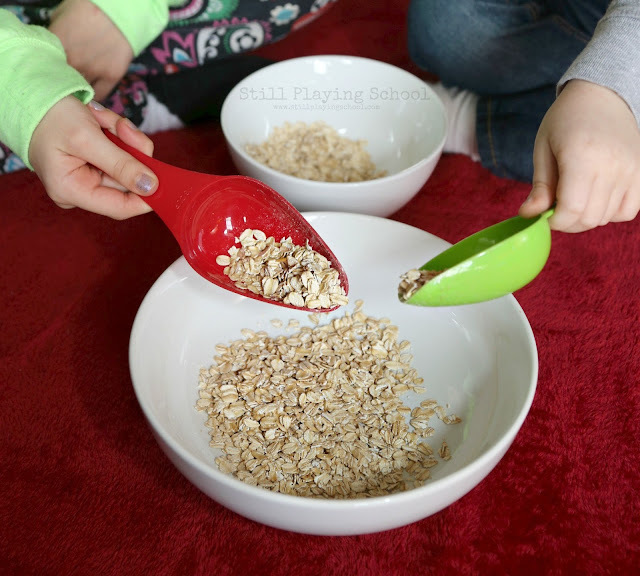 We've even whipped up the recipe with our son's entire preschool class! 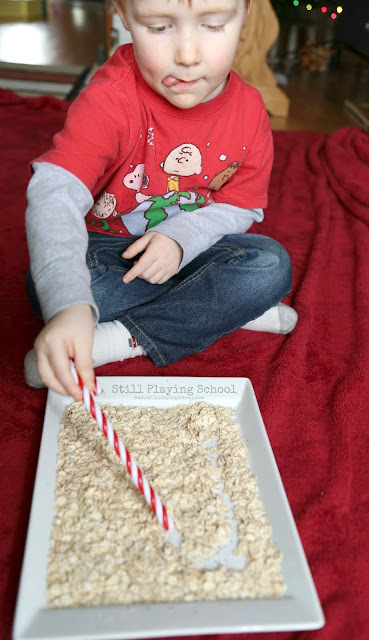 If you add a few more supplies you've got an instant holiday themed writing tray that's irresistible for little hands. 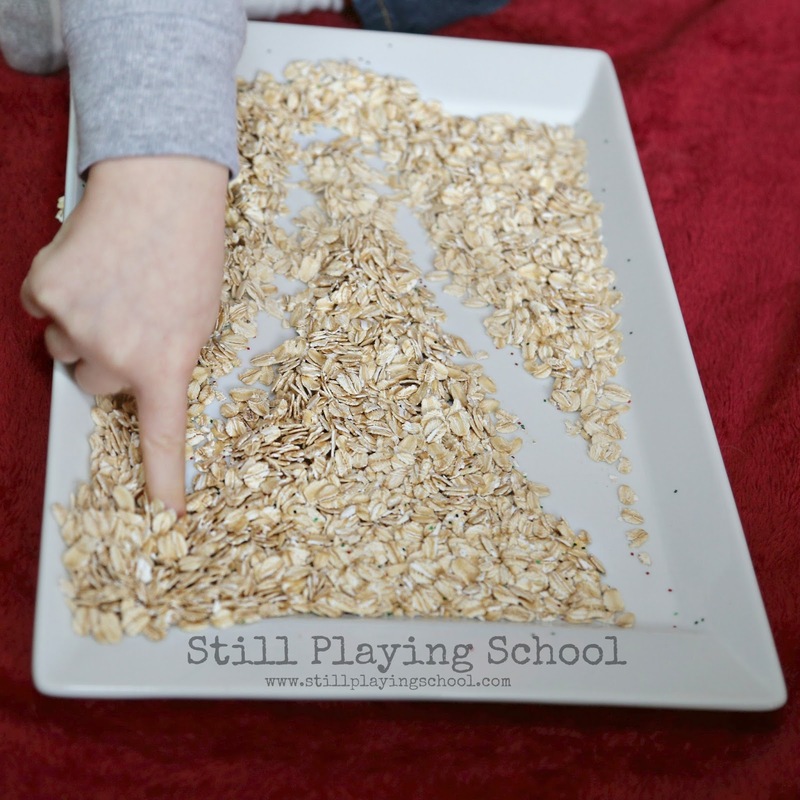 Begin by mixing oats into a bowl. 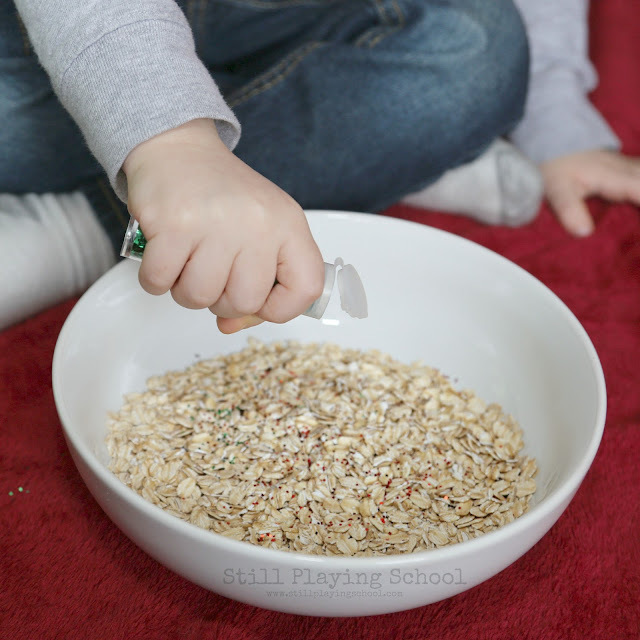 Ours was expired oatmeal that I stashed away for this project so we weren't wasting food. Invite children to scoop and pour the oats themselves to work on hand eye coordination. Next sprinkle in glitter. 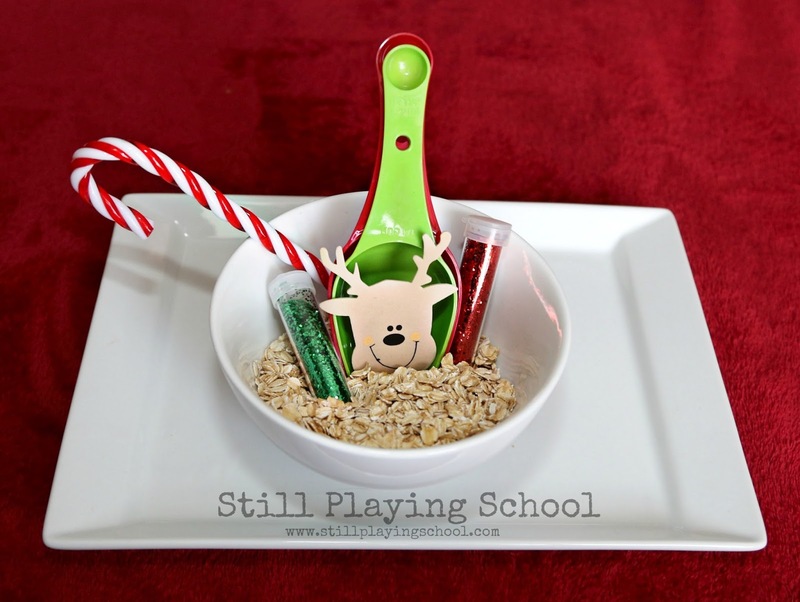 We used red and green course glitter from Craft Project Ideas because we love that it's already in a shaker and that they often send us craft products to try! Again, the kids were creating the reindeer food themselves so they loved adding the sparkle! 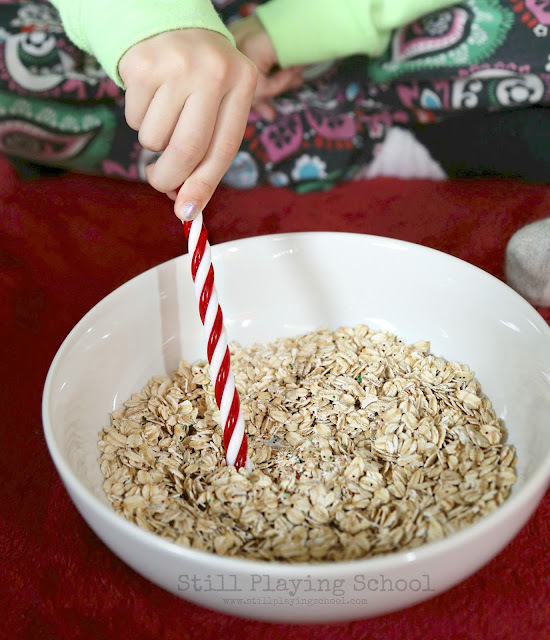 We stirred the mixture with an acrylic candy cane that we also offered as a writing implement after in our writing tray. We all loved this extra festive detail. The reindeer food is complete! At this point you could package it to sprinkle outside on Christmas Eve in preparation for Santa's arrival. Or you could pour it into a tray like we did to invite children to practice letter formation while you wait for the big day! 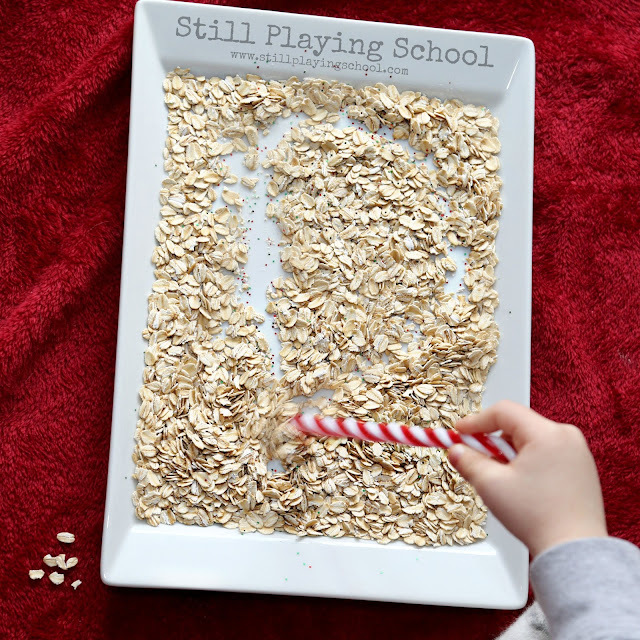 I demonstrated how to write a letter in the tray with both the candy cane and then my finger. We began with R for Rudolph! 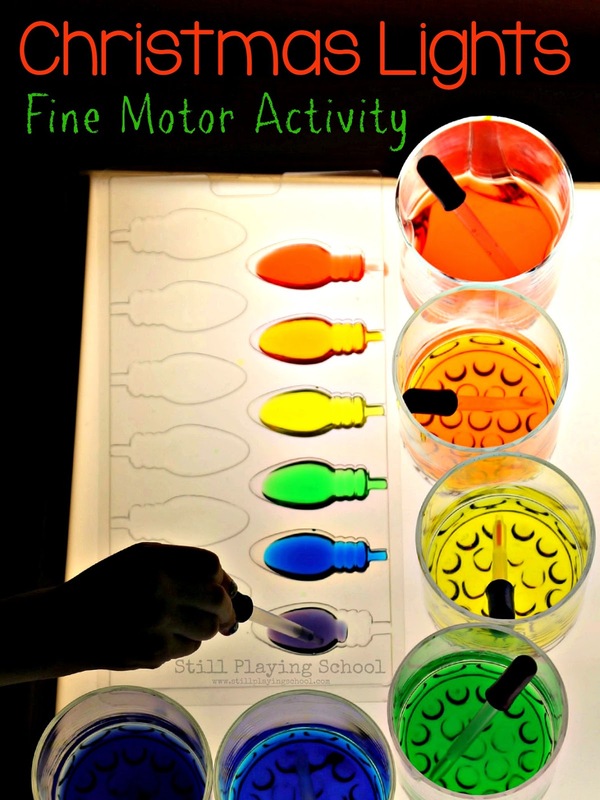 A gentle shake erases the letter to invite children to write again. 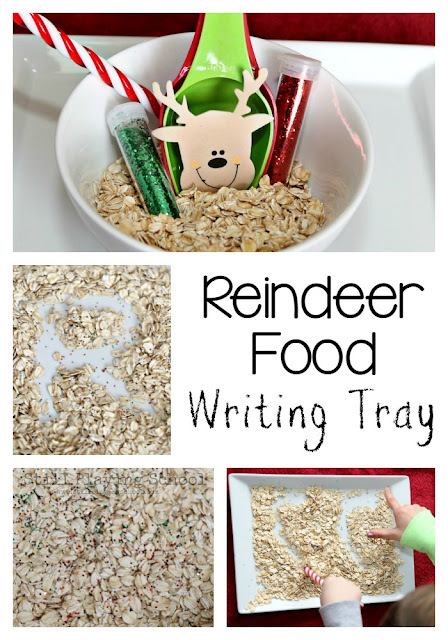 We named the other reindeer as we identifed the beginning letter in each of their names to write. D is for Dasher and Dancer (and our preschooler's name too)! 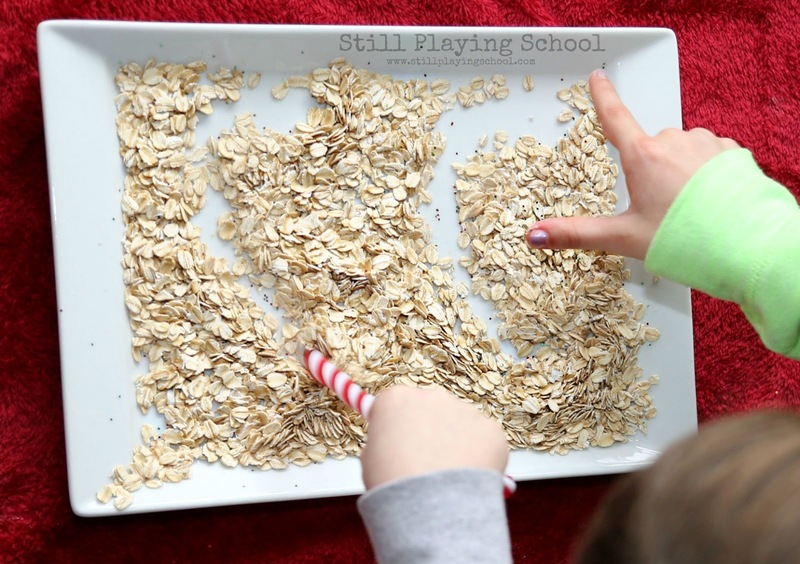 A blanket under our writing tray made clean up easy. Our first grader and preschooler worked side by side to write C for Comet and Cupid. I love how she models what she knows for him as we homeschool! Look at that concentration on the face of my reluctant writer! I was thrilled to find a motivating writing prompt for him. V for Vixen and Violet. It heals my heart when they remember their sister in every day tasks that we do together. She's always with us. 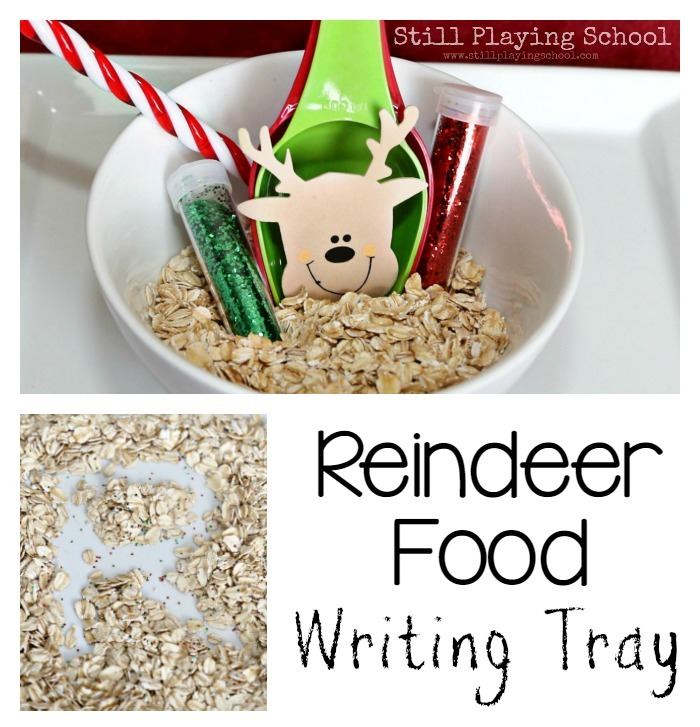 Once you're done writing don't forget to sprinkle the reindeer food outside on Christmas Eve! We heard that Blitzen likes the green glitter the best. Do you have a favorite reindeer?